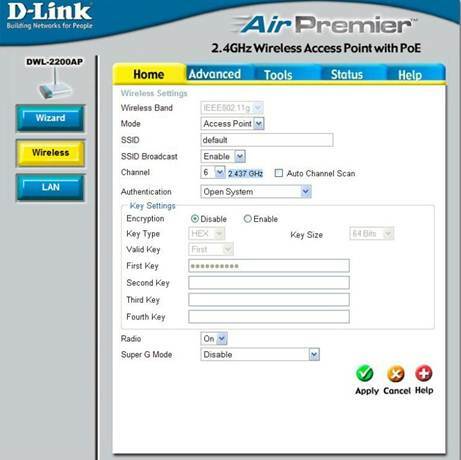 D-Link is a well-known brand in the networking domain – both wired and wireless. The DWL-2200AP is a single band wireless G router designed to create a high speed wireless network with high level of security for bandwidth hungry applications. Priced at around $170 it has great features making it a good fit for both the personal home use and enterprise use. 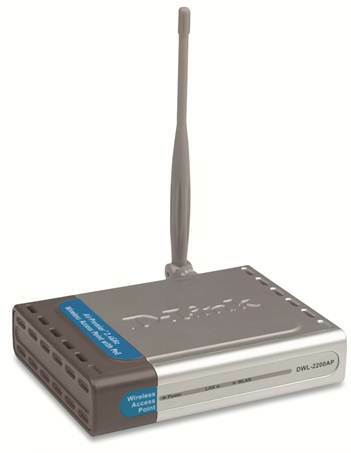 Wireless Specifications: The DWL-2200AP is a wireless G device that is capable of supporting speeds of up to 54 Mbps. In a special mode called the Super G mode, the device can support speeds of nearly 108Mbps providing ample bandwidth for the high capacity applications like videos, gaming and other bandwidth intensive applications. The device also supports the older wireless ‘b’ standard, allowing the enterprise to upgrade the wireless network gradually. The DWL-2200AP comes with 802.3af standard support also called Power over Ethernet. The PoE is a very important advancement in the wireless technology as it allows the wireless access point to draw power from the Ethernet cable directly. This greatly reduces the cost of wiring the devices and also aids in simplifying the design. Wireless Security: The DWL-2200AP comes with state of the art wireless security features in Wi-Fi Protected Access – WPA and WPA2. The device supports two flavors of WPA: the personal and the enterprise. The WPA Personal and the WPA2 Personal encryptions are very similar to the WEP wherein a pre-shared key is used to secure the wireless network. WPA2 is the more advanced version and is a lot more secure than WPA. The WPA Enterprise and the WPA2 Enterprise versions use a more stringent encryption technique that is apt to ensure high security in the corporate networks. They are compatible with the RADUIS servers that can define the unique set of authentication methods for individual enterprise users. Here again with the use of Advanced Encryption Standard (AES), WPA2 is a stronger solution than WPA. DWL-2200AP also supports 802.1x where the access point authenticates the connecting devices using a dedicated authentication server. If the server detects an unauthorised device, it is denied access by the access point. Device Management: The DWL-2200AP is a device that is designed to work with home users as well as enterprise. For the home users, the device can be configured from the web browser by connecting to it through Ethernet cable or wirelessly. In the enterprise, the wireless access points, not only need to be configured, but regularly managed. For such needs, the device also supports SNMP so that it can be managed using any standard network management system. D-Link provides its own version of the AP manager to monitor the traffic and manage the devices which makes the whole process a lot simpler too. Wireless Operating Modes: DWL-2200AP can operate in three distinct modes, although each device can be configured to work in only one mode at a time. The table below describes the operating modes. Access Point (AP) This mode is used to create a wireless LAN. The device becomes the hub of the LAN to which all the wireless devices connect. WDS with AP In this mode, the device still acts as a wireless access point (AP Mode). It also supports multi networks aiding in creating a more complex enterprise wireless network. Device Configuration Utility: The first step to configuring DWL-2200AP, using the web browser, is to prepare the computer that connects to the device. There are two things that need to be changed in the computer. Follow the steps mentioned below to access the configuration setup. 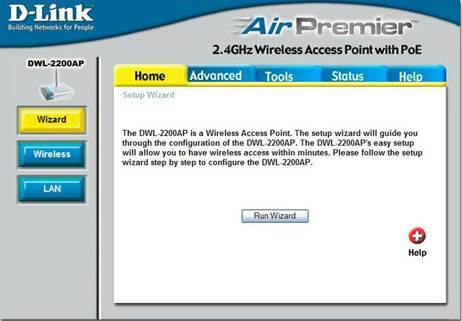 D-Link Air Premier setup wizard is launched. Select the Wireless menu to configure the wireless network settings.